Our community of low-income residents is large and profoundly challenged by the cost of living in Marin. Government support for the less fortunate continues to shrink. 83% of SNAP households have gross income at or below the 100% U.S. poverty guideline ($19,530 for a family of 3 in 2013). SNAP benefits don't last the whole month. 90% of SNAP benefits are redeemed by the third week of the month. The average monthly SNAP benefit per person is $133.85, or less than $1.50 per person per meal. 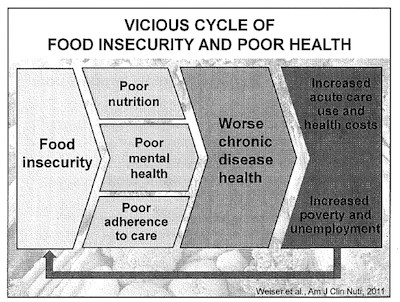 1 "Coping with Accelerating Food Needs in San Francisco and Marin," Stanford Center for Poverty and Inequality, July 2012. 2 "Making Ends Meet in Marin," First 5 Marin Children and Families Commission, December 2017. 4 "Missing Meals" in San Francisco and Marin," Christopher Wimer and Lucas Mansfield, SF-Marin Food Bank, February 2017. 6 2013/2014 Marin County Civil Grand Jury, "Aging in Marin: What's the Plan?" 7 Marin County Aging and Adult Services Needs Assessment, 2015. 9 "How Far Do SNAP Benefits Fall Short of Covering the Cost of a Meal?" Urban Institute, February 22, 2018. 10 American Journal of Clinical Nutrition, Dr. Sheri Weiser et al., 2011. Emmy Award-winning producer Paul Colardo recently created a brief documentary on Hunger in Marin. You can watch it, free of charge, here.